Join Ambassadors for Children and sweethearts, Bill and Virginia Darr for an evening of dinner, silent auction, dessert sampling, fashion show and entertainment. New for 2019, AFC is excited to announce the introduction of our #IamMe fashion show, highlighting what your gifts mean to the foster children we serve every day. Ambassadors for Children's (AFC) mission is to have all local children in foster care will feel valued and needed by providing physical items and support that will, in turn, boost their self-esteem. 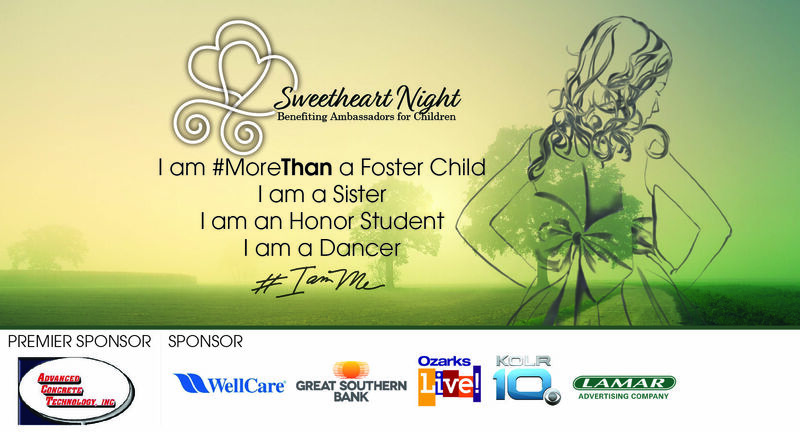 Sweetheart Night benefits Ambassadors for Children and is part of the #IamMe Campaign for the month of May. Includes dinner and dessert sampling. Includes dinner for 10 and dessert sampling. Council of Churches of the Ozarks has partnered with Give Lively to securely process your online donation. This transaction will appear on your credit card statement as "Council of Churches of the Ozarks". This transaction is subject to Give Lively's Terms and Privacy.